Attendance clocking for workers has been around for decades; the difference is the way data is collected; the objective remains to trace the time an employee works for a company. The time data is significant for a business entity not only for payroll purposes but also more importantly for the company to comply with the labor law. Punch clock, RFID card, and barcode are some of the most commonly used clocking methods and now cloud attendance is the future. Having similar objective with the rest of the time attendance solutions, we present you 7 key factors why cloud attendance should be your business obvious choice today! Some cynics would argue that cloud solution is not new; it’s not something to get excited about anymore, yaddi yaddi yadda. Yes, it’s true that cloud is no longer a novelty solution. However, cloud solutions provide convenience that no Windows or other conventional solutions could ever offer. Data centralization is key to efficiency today; you want the data to be available when you open your laptop and when you access your smartphone, and cloud attendance like TimeTec TA definitely gives you that and even more. Today’s world is so mobile, one can be at home working and one can also be away from the office and working; the office is not the ultimate workspace anymore. Cloud attendance like TimeTec TA caters to staff mobility with various easy clocking options provided on your mobile phone app, from GPS to NFC and Beacon clocking. And for the stationary personnel at the office, biometrics and pc clocking are available to link to TimeTec TA too. As your organization expands and downscales, your organizational needs change. 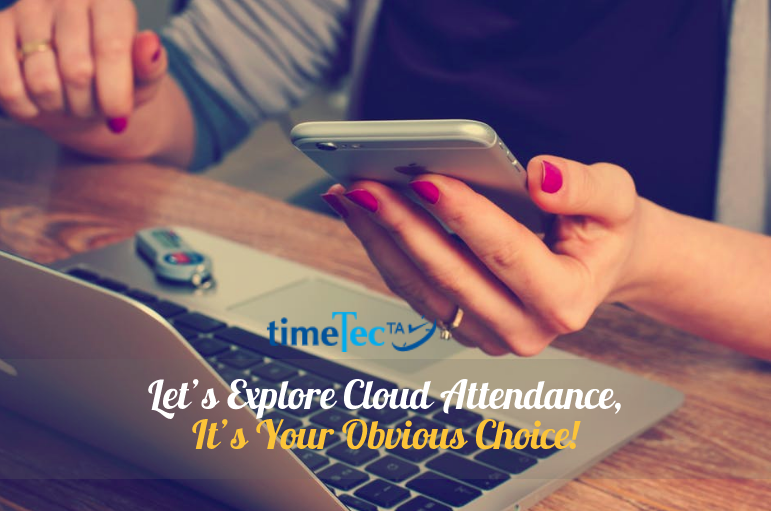 Cloud attendance such as TimeTec TA caters to that with its scalable offerings. Subscribe only what you need and add more as you grow and vice versa. And the absence of hardware and infrastructure investment in cloud solution makes it easier for your business to make decision. Access to data in many companies has always been one sided where only the company has access to your information. Cloud attendance provides you with your own data and your immediate staff’s data to enable you to oversee the overall performance, to rectify and remedy wherever necessary. The accessibility to one own’s data strengthens staff’s morale and boosts accountability. Utilizing cloud attendance like TimeTec TA, data lost is a myth. For TimeTec TA, data is backed up securely in at least two servers, guaranteeing data availability at all times and data retrieval is easy, providing convenience at its best. Unlike the conventional system where you have to tabulate attendance data, do configurations through different PCs without guidance and support, Cloud Attendance made it easy by centralized configurations and settings, applicable to many branches. Data tabulation and analysis can also be easily obtained through this online solution. Cloud attendance like TimeTec TA is good for the environment. Providing flexibility in clocking methods, staffs do not need to travel back and forth to the office space to clock out, as he or she can do it from a mobile phone and the company still receives genuine attendance data. Cloud attendance also lessens the use of paper and pen because everything is handled electronically. Open an account with TimeTec TA, get your 10 user licenses free for life, and experience the convenience of Cloud Attendance. Click www.timetecta.com for more information. TimeTec TA App is provided for free with free licenses and subscription. Overtime Approval processes can be complicated sometimes, especially when it requires more than one approver. Based on a company’s policy, Overtime Approvals can be made before or after the overtime shift itself. Normally, Overtime Approvals are requested manually by submitting printed application forms to managers. 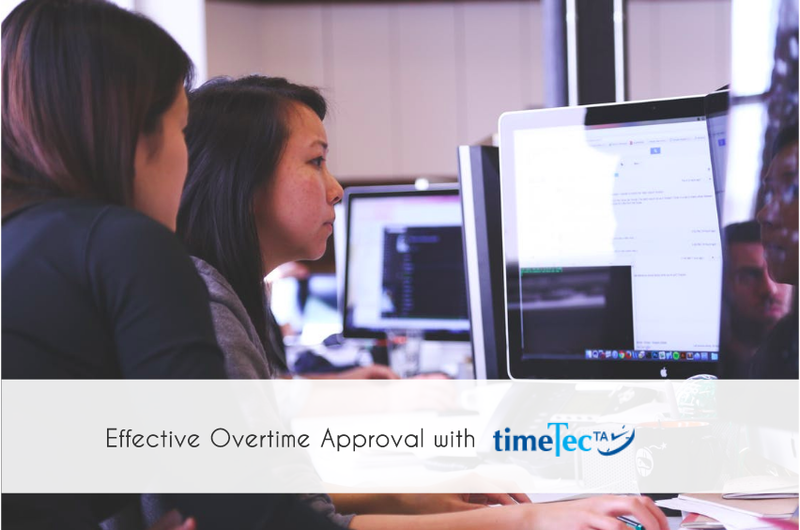 TimeTec improves the Overtime Approval process by permitting an admin to setup Overtime Approval rules and send notifications on Overtime Request Status automatically to employees who requested the overtime. This feature speeds up the whole overtime approval process and everything is done accurately based on the set rules. Name the Approval Process. 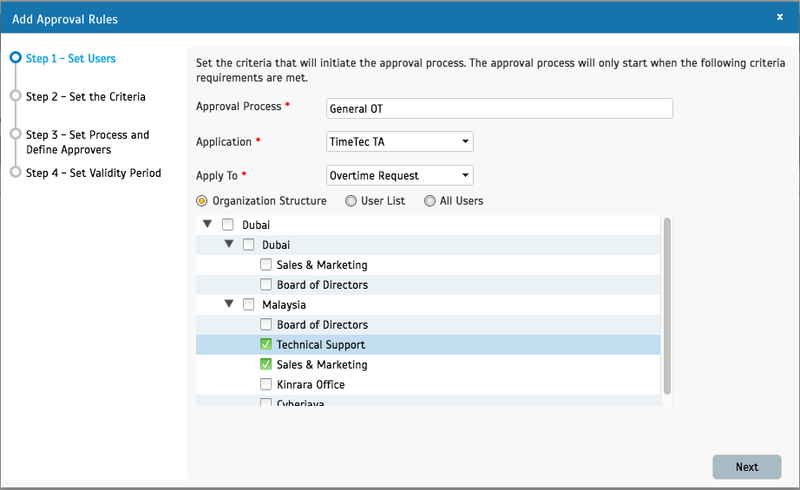 Select the application where the approval process will take effect, in this case, TimeTec TA and select Overtime Request. Select the users to apply this approval rules. 2. Set the criteria to initiate the process. Based on the rules above, select the information accordingly. 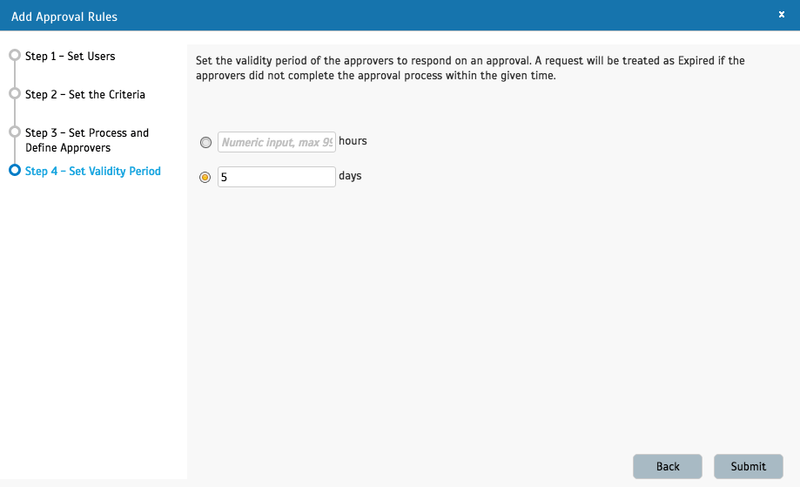 You can set Auto Approve for automatic approval, or select Set Approvers if you need specific personnel to do the approval process. 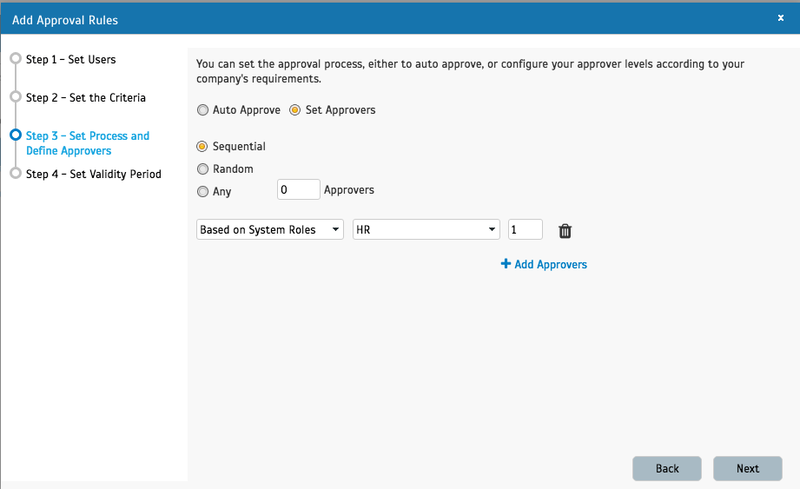 Select ‘Set Approvers’ to set the approval process either by sequential, random or any number of approvers. Select the approver name to proceed. For this scenario, let’s set for ‘Sequential’. Click ‘Add Approvers’ and select ‘Based on System Roles’ or ‘User’ and put the approval sequence accordingly. You can set the application validity period for the approvers to respond. For example, 5 days. Application that has not been approved within 5 days will expire. Once you have submitted, you will see the approval rules has been added in and will be initiated on the effective date. Once the approval rules have been set, users can start applying for Overtime via TimeTec TA. 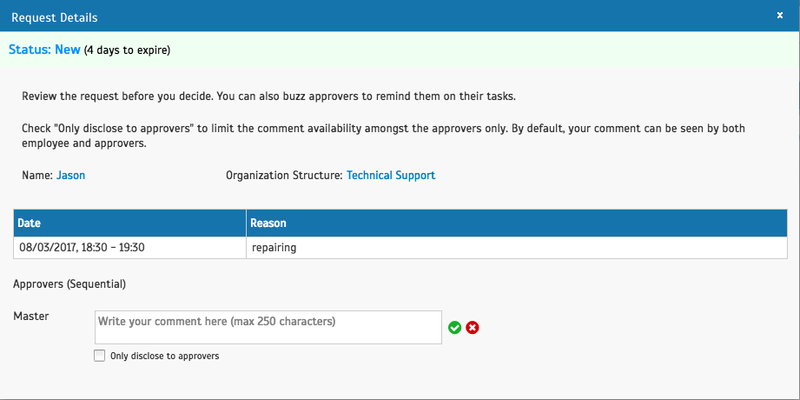 Requests can be made from the Approval section or from Roster. Select the date and time for the overtime and provide the reason. User will be notified via mobile notification once the overtime has been approved. 1. Go to Approval to view any New requests. Click at the Status to view the request details. 2. To approve or reject, insert your comment and click on the approve or reject button. Select ‘Only disclose to approvers’ to limit the comment view to approvers only. Otherwise, both approvers and applicants can see the comment. We hope you will find this newly added approval features beneficial and improves your overtime management. 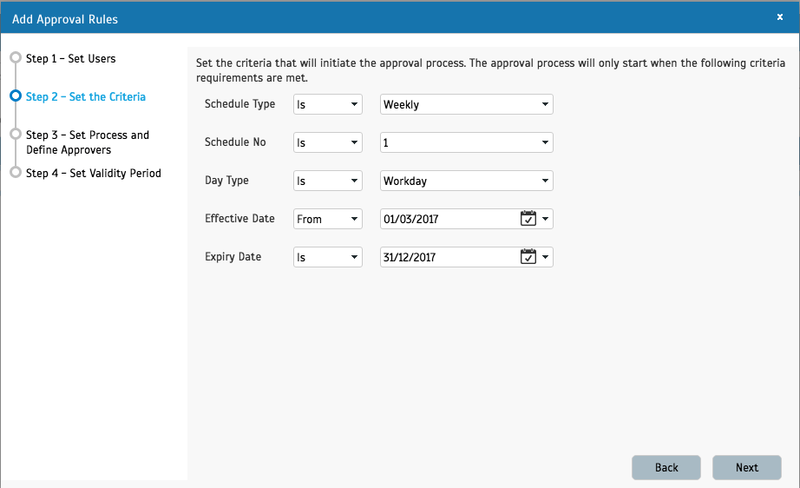 We will be enhancing the approval feature with more functions such as attendance editing approval and swap shift, so stay tune with us at TimeTec.